Compound Butters are a great way to get some added fat into your meals. Our Bacon & Parmesan Flavored Compound Butter is delicious, melt it over vegetables or steak to make your dinner a little bit fancy. In a large non-stick frying pan, fry the bacon until it is crispy. Allow to cool. Add the bacon to your food processor and blend on high speed until it resembled large crumbs. Add the remaining ingredients to the food processor and blend on medium speed until all ingredients are combined. 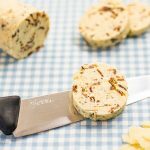 Spoon the butter onto a sheet of cling film and gently roll into a log shape. Store in the fridge or freezer.